Have you ever heard of a French Silk Pie? It's something I've heard about for ages, but never really looked into until fairly recently. 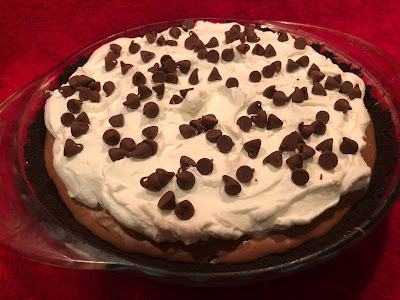 It's basically just a chocolate mousse pie, and it's very rich and creamy, much more so than just chocolate pudding in a pie crust! I recently made one for the first time and thought "why have I waited all this time???" It's really one of the most rich and decadent chocolate somethings I've made in quite a long time. And it's a bit more sophisticated than chocolate pudding. Absolutely delish! Now, I have to say, there are a couple things worth noting. From what I've read, a TRUE French Silk Pie has eggs in it, but the pie itself is not cooked. I know, I know, everyone always says you shouldn't eat raw eggs, right? Well, honestly, I kind of don't worry about that. I've seen Anne Burrell taste her raw scrambled eggs to make sure they're seasoned enough, and I've also heard Sara Moulton say that she doesn't really worry about it either. But if that worries you, all you have to do is use pasteurized eggs. Problem solved! And the next thing about this pie is the texture. It's SO rich and creamy and sets up into the perfect slice of pie! The tricky thing is all about the sugar. You should use really superfine sugar for this pie, because the sugar needs to dissolve as you whip the filling. Regular granulated sugar may not dissolve completely, and your pie might not be completely silky smooth. And finally, I know I always choose recipes that don't take a lot of time, but this one takes a little extra. I mean, it's still super easy to do.. (easy as pie, quite frankly!) but the extra time is completely worth it! Have I ever lied to you before???? And besides, you can use the extra whipping time to multitask! I used it to empty/reload the dishwasher, but you do you! Anyway, if chocolate is your thing, you simply MUST try this recipe. I found it on a blog called Averiecooks.com, and it's definitely a keeper! Preheat oven to 350F and spray a 9-inch pie dish wish cooking spray; set aside. Add Oreos to the canister of a food processor and process until finely ground, 1 to 2 minutes on high power; set aside. In a small microwave-safe bowl, melt the butter, about 1 minute on high power. Add melted butter to canister of food processor and process until incorporated, about 30 seconds. Turn crumbs out into prepared pie dish and using your fingers, hard-pack the mixture to create a crust, making sure to cover sides of pie dish. Bake for 10 minutes, or until just set. Place on a wire rack to cool. In a medium microwave-safe bowl, melt the chocolate, about 1 to 2 minutes on high power. Stop after 1 minute to check and stir. Heat in 15 second increments until chocolate can be stirred smooth; set aside to cool. To the bowl of a stand mixer fitted with the paddle attachment, add the butter, sugar, and beat on high power until very light and fluffy, about 5 minutes, stopping as necessary to scrape down the sides of the bowl. Mixture should be very pale, almost white; the lighter and fluffier the better to ensure sugar is well on it’s way to being dissolved and incorporated fully. Add the vanilla, espresso granules, salt, cooled chocolate, and beat on high power until incorporated and mixture is fluffy, about 3 to 4 minutes. Stop, scrape down the sides of the bowl, remove paddle attachment, switch to whisk attachment, add 1 egg, and beat for 5 minutes on high power. Stop, scrape down the sides of the bowl, add the second egg, beat for 5 minutes on high power. Repeat process with remaining eggs. Eggs are added 1 at a time, spaced 5 minutes apart, for a total of 20 minutes active whipping time. After 20 minutes, make sure your mixture is smooth, silky, fluffy, with zero traces of graininess. Continue beating until you’re satisfied with the smoothness because this is what your pie will taste like. Turn mixture out into crust, smoothing the top lightly with a spatula. Cover with plastic wrap and place in fridge for at least 4 hours (overnight is better) for pie to set up fully. Add the whipped topping/cream, smoothing it lightly with a spatula. I left a bare margin of 1-inch for visual appeal so you can see the chocolate; cover surface fully if preferred. Sprinkle evenly with chopped chocolate before slicing and serving. Pie will keep covered in the fridge for up to 5 days. I think the next time I make this (which will be VERY SOON), I'll probably try it with just a regular pie crust. Since we're going to all this trouble to make sure it's smooth and silky, I was kind of thinking that a crumb crust was working against me. Just a thought! Also, I know the recipe says to let it chill for at least four hours or overnight, but mine set up beautifully after just three. Just sayin'! Also, I opted for a few sprinkled milk chocolate chips instead of chopped chocolate. It's just easier! Ok, I know I already have several chocolate cake recipes, but can you really have too many?? I think not! So here we go. I recently made this for a dinner at the request of my niece, Terri. 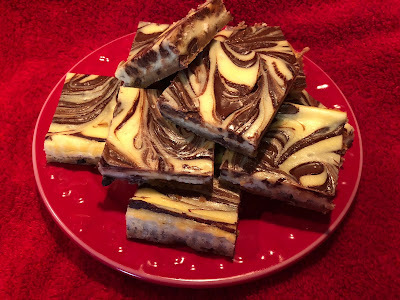 Actually, when she first showed me this recipe (that she found on a blog called Ready Set Eat) she said "you can use whatever cake recipe you want. I really just want the whipped peanut butter frosting." Ha! Normally, my go to chocolate cake recipe is Hershey's Black Magic Cake, but I compared the two, and they're very similar, so I figured I'd go with it. And guess what?!? It's just as good! It's rich and moist and very deep with chocolate flavor. I think the secret is the cup of coffee. It makes any chocolate cake SO much more rich! (It doesn't actually make the cake taste like coffee, it just makes it taste like a deeper chocolate!) Clever, huh? For this cake, I did most of the decorating myself, but then I got an assist from Terri's youngest, Grace. I must say I'm kinda sorta proud of the drip design. It can be a little tricky to get just right! And yes, yes, I know it's piled with A LOT of candy, but when you have a 4 year old helping you, you just keep going. I think it makes it all the more fun and everyone loved it! 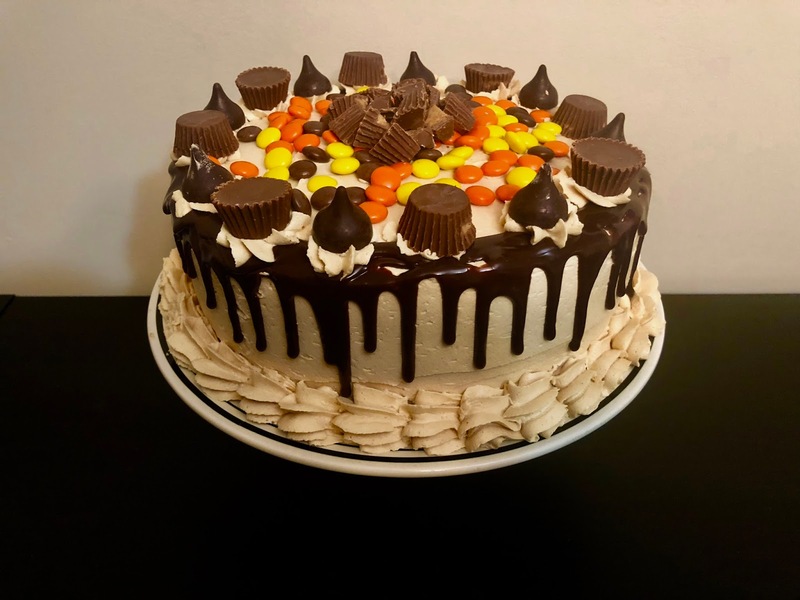 Definitely make this the next time you want a showstopper for a special occasion, or you can just make it because your niece wanted an excuse to have whipped peanut butter frosting. Spray two 9-inch round cake pans with baking spray. Stir together coffee and cocoa powder in medium bowl; set aside to cool. Stir together flour, baking powder, baking soda and salt in another medium bowl; set aside. Whisk milk, eggs and vanilla into cooled cocoa mixture until well blended. Beat 1/2 cup butter and sugar with an electric mixer on medium high speed until light and fluffy, about 3 minutes. Reduce mixer speed to low and gradually beat in the egg mixture until well blended, scraping down the sides of the bowl as needed. Gradually beat in flour mixture until just combined. Divide batter evenly between cake pans. Bake 30 to 35 minutes, until toothpick inserted in center comes out clean. Cool on wire racks. Meanwhile, place remaining 1 cup butter, peanut butter and 4 tablespoons heavy cream in large bowl. Beat with an electric mixer on medium-high speed until light and very fluffy, at least 5 minutes. Reduce mixer speed to medium and beat in powdered sugar 1/2 cup at a time until well blended. Invert one cake layer out onto serving plate and press lightly to secure it in place. Spread about 1 cup of frosting evenly on top of first layer. Invert second layer onto frosting, make sure the layers line up evenly and then lightly press down to secure top layer in place. Frost entire cake with a light layer of frosting; refrigerate 15 minutes. Meanwhile, microwave 2 tablespoons heavy cream in small microwave safe bowl 30 seconds, until hot. Stir in chocolate chips until melted. Frost cake with a thick layer of frosting. Drizzle with chocolate sauce and decorate with peanut butter cups or other candy. The key to making the perfect drip design is to make sure the cake is very cold. You should also make sure the ganache is not too hot, but still warm enough to pour. Then when you drizzle it around the perimeter of the cake, the cold cake will chill the ganache and stop it in its tracks, and that's what keeps it from dripping all the way down. If you know me, you know that I'm not a sports fan. Baseball, Soccer, Basketball, Football, I don't discriminate, I don't watch or follow any of it. I recently showed up at my brother's Superbowl party, and I may or may not have been greeted with a "wow, what are you doing here?" kind of a vibe. LOL (tbh, I think that was the first time I watched any football game since I was in high school. Not even kidding) But I figured since everyone was so hyped about the Eagles playing, I might as well join in the excitement. There is, however, one exception to my non-interest in sports, and that is The Olympics. The ceremonies, the personal stories, the lifelong dreams, the culture of the host country, I love ALL of it and I'm absolutely glued to the TV for the 2 1/2 weeks that they're on. I even record several channels that air the different events so I won't miss anything. 100% true story! I always make something in honor of the host nation, so I decided to try my hand at Korean food, since this year's Olympics are being held in PyeongChang. And, of course, this means it should probably involve their national dish, Kimchi, which traditionally is a spicy and sour fermented cabbage dish that is served with nearly every meal. From what I've been told, Kimchi is kind of sacred and most Koreans feel like if they haven't eaten Kimchi, then they haven't eaten yet that day. To be quite honest, I had never even tasted Kimchi let alone cooked with it, so I did a lot of googling. I happened to find this recipe on a blog called My Korean Kitchen. The blogger mentioned that she had been wanting to try using a slow cooker for some of her Korean recipes, and I figured this one seemed to be perfect for our Olympics night. I made my list of ingredients, and off to the Asian market I went. Perfect! The recipe is absurdly easy to make because you literally just throw everything into a slow cooker, turn it to low, and leave it there for about 8 hours. And OMG it is SO flavorful! It has just a little spicy poke, but you can adjust that to your liking. (tbh, I don't like something that will burn my face off, but I do like a little afterburn.) Anyway, overall, I think my first attempt at Korean food was a HUGE success. I'm definitely awarding myself a gold medal for this one! If you want something warm and comforting with a little spicy hit, you should definitely consider trying this one. It's absolutely delicious! Rinse the steak in cold running water to get rid of the blood. Pat it dry with some kitchen paper. Cut them into small chunk pieces. Add all ingredients in a slow cooker. Set the slow cooker on low heat and cook it for 8 hours. Stir it a bit occasionally. (The food is ready to eat from the 5th hour. However, an additional three-hour simmering makes the Kimchi and the meat even more tender.) Serve the stew with rice once it is cooked. You can use any kind of meant instead of (or in addition to) the beef, but just be sure to choose something that is not so lean (as suggested on the original recipe). I used beef, but I also added some pork belly. 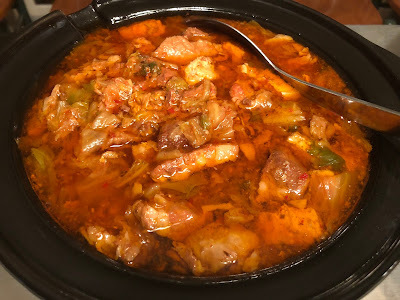 The meat becomes much more tender and the fat melts into the stew and makes it rich and SO flavorful! I didn't have rice wine, so I used dry sherry. I believe you can also use sake or mirin. And instead of using the gochujang, I used sambal oelek, which is another kind of chili paste. Absolutely delish! If you love Nutella (chocolate hazelnut spread) as much as I do, then you simply MUST try this recipe. It's from Pillsbury, so you already know that it's gonna be amazing, and OMG wait'll you taste it! I was looking for a picky-uppy dessert something, and as soon as I saw it, I couldn't wait to try it. Actually, I'm not even kidding when I say that. I stopped what I was doing, went to the store to buy the ingredients, and made them as soon as I got home. And of course they were as decadent as I thought they'd be! I've literally made them twice in as many weeks. The first time I made them was just as a little thank you to my friend Anthony, who said that "they might be his favorite thing ever." Then I made them for a my friend Marie's dinner party where they got RAVE reviews from everyone! I PROMISE you'll get the same reviews when you make them too! Place cookies in ungreased 13x9-inch pan. Press dough evenly into pan. Bake 9 to 13 minutes or until light golden brown. Cool 10 minutes. Meanwhile, in large bowl, beat cream cheese, sugar, vanilla and eggs with electric mixer on medium speed until smooth. Spread evenly over baked crust. In small microwavable bowl, microwave hazelnut spread uncovered on High 10 to 20 seconds to soften. Drop teaspoonfuls of spread on cream cheese mixture. With knife, carefully swirl spread into top of cream cheese mixture. Bake 25 to 30 minutes longer or until filling is set. Cool 30 minutes. Refrigerate about 2 hours or until chilled. My only thought about the recipe is that I wish the bars were THICKER (because, as I always say, more is more!) Both the crust and the filling are very thin, which is perfect when you're just picking them up to eat them. But I wonder what it would be like to increase the recipe by half, or maybe even DOUBLE it to have a more of a swirled cheese CAKE, know what I mean? I will definitely be giving this a try. Of course, I'll let you know how it goes! If you'd like to make the crust from scratch, just use your favorite chocolate chip cookie recipe, but it seems to me that this is one instance where store bought is just as good!